Since 2001, Trinity has been a “Reconciling in Christ” congregation, welcoming members of the LGBTQ community into its church family and ministries. The decision was made with the realization that Trinity has long been a place of welcome and inclusiveness, that the “Reconciling” designation was not so much a new direction, but rather a reflection of who we have been and are. As a community of the people of God, we are called to minister to all people of our world, knowing that the world is often an unloving place. Our world is a place of alienation and brokenness. Christ calls us to reconciliation and wholeness. We are challenged by the Gospel to be agents of healing within our society. We are strengthened as God’s people when the gifts and insights of diverse people are shared and expressed within our congregation. We affirm with the apostle Paul that in Christ “there is neither Jew nor Greek, there is neither slave nor free, there is neither male nor female” (Galatians 3:28). We acknowledge this reconciliation seeks to diminish barriers between God’s people, opening us to our unity in Christ as both recipients and vessels of his love and grace. 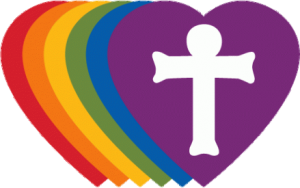 that as members of the congregation, gay, lesbian, bisexual and transgender people are expected and encouraged to share the sacramental and general life of this congregation, including all positions of service and leadership.